It’s an essential amino acid your body needs to function properly. But you have to get tryptophan through your diet or supplements because your body can't make it. Tryptophan can supports increased brain levels of both serotonins and melatonin. They enable a calm frame of mind and sleep respectively. 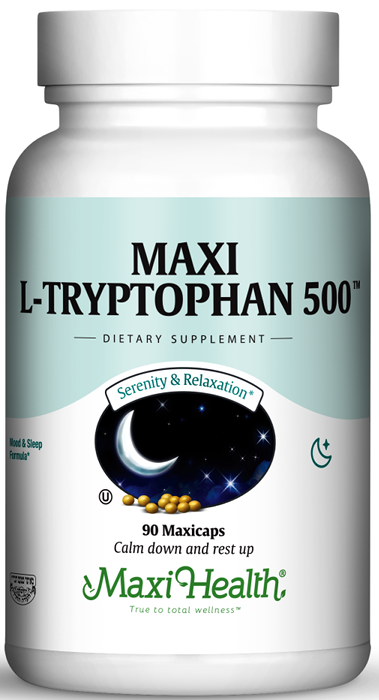 Try Maxi L Tryptophan 500™. Take one (1) or two (2) Maxicaps™ at bed time, or as directed. For best results, take with MeloMax from Maxi Health Research® LLC. This product contains no animal products, wheat, gluten, yeast, soy, salt, sugar, milk, artificial flavors, colorings or preservatives. AjiPure™ and TryptoPure™ are trademarks of Ajinomoto Co., Inc.